Whenever a national leader justifies aggressive military action against others by invoking the phrase “humanitarian crisis” – as Barack Obama did to explain why a no-fly zone was being imposed on Libya – the most appropriate reaction may not be “to reach for my revolver”, to quote a long-forgotten German playwright, however tempting that might be. But stretching out a hand for a zinc bucket to hurl into sounds like a pretty good alternative. 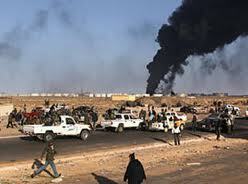 This is not to deny that Libya does indeed face a potential calamity. The embattled Col. Gaddafi, his family, tribe and assorted associates and hangers-on are facing political, financial and possibly physical extinction at the hands of rebels – whose precise political orientation remains a mystery despite a heavy media presence in their strongholds – and clearly they will fight, and fight dirty, to make sure that does not happen. But this is not the first time that an oppressive regime has threatened its own people, or other countries’ people, with slaughter and that fact serves to highlight the embedded dishonesty and hypocrisy of the joint Obama-Cameron-Sarkozy venture. If the prospect of a “humanitarian crisis” was an honest reason for military intervention then the three national leaders would be pretty much doing nothing else every day except issuing threats or organizing military sorties into other peoples’ countries. They would be telling the leaders of Bahrain, Syria, Saudi Arabia and Yemen, for instance, to lay off their pro-democracy protesters; they’d impose a no-fly zone over Zimbabwe or otherwise threaten to rein in Robert Mugabe, toss Cruise missiles at the Burmese military dictators and long ago have sent legions of the Green Berets, the SAS and the French Foreign Legion into Darfur. down on the heads of Palestinian children with murderous consequences for scores. Not only did that not happen but the newly-elected Obama, vacationing in Hawaii at the time, could not be persuaded to utter even one word of condemnation or disapproval. To be fair to the US president, however, this is one military adventure which the Americans appear to have been the most reluctant to join. The lead has been taken instead by French president, Nicolas Sarkozy and British prime minister, David Cameron who heads a coalition Tory-Liberal Democrat government in London. The two Europeans had been pressing for action against Gaddafi for more than a week before Obama, apparently also urged to travel down this road by Hillary Clinton, finally gave in. Sarkozy’s reasons for joining this anti-Gaddafi expedition have, according to one persuasive account, much to do with the confluence of two uncomfortable realities and very little with the catastrophe that inaction could bring to the unfortunate Libyans. 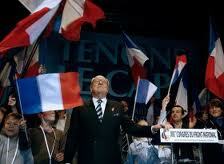 him trailing behind the Socialists and the quasi-fascist, anti-immigrant National Front founded by Jean-Marie Le Pen. In a bid to fend off the challenge from the extreme right, Sarkozy last year decided to join Le Pen’s people in the gutter and ordered the expulsion of France’s Roma population. Pandering to French xenophobia made little difference and now Sarkozy faces the real prospect of entering the history books as a one-term president. But as Margaret Thatcher discovered in the Falklands, as did George W Bush after the invasion of Iraq, nothing does quite as much good for a politician’s re-election prospects – particularly when you’re third in the polls – than a war, especially one your people believe you are leading. 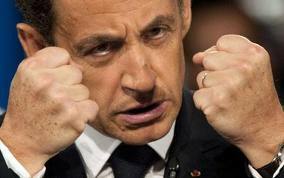 Sarkozy - no more "Freedom Fries"
makes, the US media have placed Sarkozy in the “no-fly zone” limelight. To be sure Sarkozy was the first to give official recognition to the Libyan rebels and French jets did fly the first missions over Benghazi but to focus on this risks missing one of the big stories of the Libyan adventure: the role of neocons in shaping British prime minister David Cameron’s enthusiastic support for the Libyan escapade. persisted. When he ducked a question in the House of Commons over whether he would wait for a UN resolution on Libya before committing Britain to a no-fly zone it raised the intriguing possibility that Cameron might be ready to go down the same path traveled by Tony Blair in 2003 when he and Bush cut a secret deal to go to war in Iraq without the UN’s approval. And Cameron’s ministers have let it slip that, notwithstanding that the terms of the UN resolution do not authorize regime change, getting rid of Gaddafi and even killing him is very high on the British agenda. 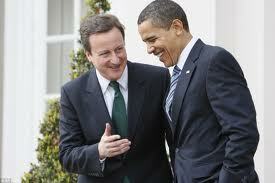 Dave and Barry share a joke - but does Obama really know about his friend's friends? that it was not planned “at this stage”. Should there be any doubt what the real intentions are, it is worth remembering that it was a British submarine that targeted Gaddafi’s compound in Tripoli with a missile strike shortly after the no-fly zone was authorised (the same compound, incidentally, bombed by Reagan in 1986 in a raid that killed Gaddafi’s adopted daughter). So there seems reason to believe that in Cameron’s mind at least, the Libyan intervention is less a humanitarian intervention intended to relieve the hard-pressed rebels and avoid the slaughter of civilians and more a war whose aim is to overthrow the Gaddafi government and to achieve regime change. David Cameron, like many British Tories, has some compelling reasons to get rid of Gaddafi although commercial motives such as access to Libyan oil and enhancing trade links are not among them. Cameron’s predecessor, Tony Blair long ago took care of Britain’s interests in that regard, secretly offering in 2005 to hand over Libyan dissidents hiding out in London (yes, the same ones whose friends in Libya the West is now so eager to protect) to Gaddafi and almost certain death (and later freeing the Lockerbie bomber) just at the time that Libyan oilfields were made available for public auction (by a remarkable coincidence by the time the hammer fell, BP and Shell had beaten out their US rivals and secured rights to all of Libya’s oil and natural gas resources). otherwise would have posed a much less formidable threat to Britain. Getting payback for all those years spent helping out Irish terrorists who killed the Queen’s cousin, Lord Mountbatten and nearly wiped out the Thatcher Cabinet would certainly give Cameron and his colleagues much satisfaction but is insufficient by itself to explain the eagerness to attach Gaddafi’s scalp to their belt. The Weekly Standard is, of course, the house magazine of the American neoconservative movement and the author of these words is the writer and think tanker, Max Boot. Although Boot dislikes the epithet, he is one of America’s foremost neocons. In fact there is hardly a neocon project of any significance in recent years that has not had Max Boot’s name attached to it at some stage or other, from the Project for a New American Century and the invasion of Iraq through to unquestioning fealty to Israel and particularly the Likud party. And remember also that key defining document produced by American neoconservatism back in 1996, ‘Clean Break’, advice to Israeli’s incoming Likud premier, Benjamin Netanyahu that a policy which embraced military force to topple unfriendly Arab regimes could ‘transcend’ the Arab-Israeli conflict, i.e. 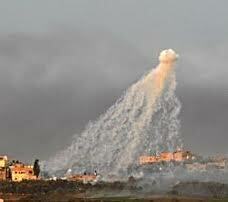 make an accommodation with Palestinians unnecessary. It is view heartily endorsed by the Atlanticists who populate the ranks of Britain’s neocons. One of the most stubborn popular myths about neoconservatism is that it is a uniquely American phenomenon and given the baleful consequences that the doctrine had for the Bush White House, never mind the rest of the world, that is hardly surprising. 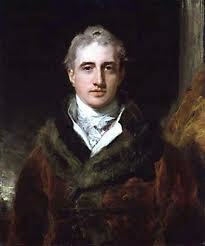 The Earl of Castlereagh - a founder of modern neoconservatism? apostles, specifically in the British Tory party at the dawn of the nineteenth century when the doctrine of intervention in other countries’ affairs was legitimized, beginning with the effort to throw Napoleon off France’s imperial throne, and the basis laid for largely unopposed British colonial expansion during the rest of the century. The claim, incidentally, is a necessary reminder that neoconservatism is just a fancy name for old-fashioned, interest-driven imperialism, justified in the nineteenth century in the name of bringing “civilization” to the rest of the world and nowadays to spread “democracy”. Well, it looks as if Britain’s nineteenth century neocons have made a comeback and have a real, pivotal influence in Cameron’s Cabinet. The prime minister himself is not formally a neocon but he has surrounded himself with neocons, given them key posts in government and has allowed his policies to be framed with significant input from neocon think tanks. 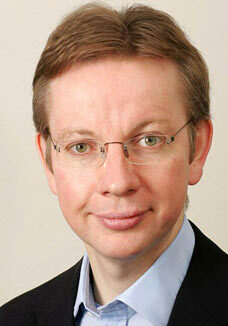 who spearheaded Cameron’s rise to the top of the Tory party. The leading figure is George Osborne, the Chancellor of the Exchequer whose economic policies will determine whether or not Cameron gets re-elected in 2014 or 2015. He is a crucial figure in Cameron’s government and has the prime minister’s ear every day. Back in 2003 when Bush and Blair were about to invade Iraq, Osborne – a member of the Anglo-Irish aristocracy – declared himself a “signed-up, card-carrying Bush fan” and told the House of Commons that he had been won over by the “excellent neoconservative case” for war. neoconservatism to a couple of early nineteenth century Tory Foreign Secretaries, George Canning and Robert Stewart, aka Viscount Castlereagh. An uncritical fan of Israel who barely bothers to disguise his contempt for all things Palestinian and Arab, Gove once compared Donald Rumsfeld to the sheriff played by Gary Cooper in High Noon. More junior Tories make up the rest of Cameron’s neocon set. They include Greg Hands, George Osborne’s Private Parliamentary Secretary (PPS), the House of Commons’ version of a public school fag. Hands holds joint US and UK citizenship and returned to America in 2008 so he could vote for the McCain-Palin ticket. 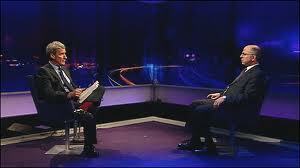 Culture Minister, Ed Vaizey is also a neocon as is Nicholas Boles, PPS to the Schools Minister. So two of Cameron’s most important Cabinet colleagues, and close personal friends, are declared neocons and a group of junior, talented and up and coming government figures are with them. Others in Cameron’s Cabinet are “liberal interventionists”, like the Foreign Secretary William Hague. A cynic might observe that “liberal interventionists” are to neocons what call girls are to hookers. They’re in the same business but one is more honest than the other about what they do. 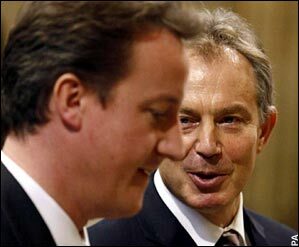 The founder, nay inspiration of the liberal interventionists is Bush’s old pal, Tony Blair, about whom Michael Gove once wrote an article titled, would you believe, “I can’t fight my feelings any more: I love Tony”. That was on the eve of the Iraq war. Guardian reporter Richard Seymour, whose insightful writing informs much of this post, once observed: “…for many Tories, Blair is neocon Rex.” So wherever he turns, Cameron is confronted by neocon influence or its surrogate, Blairism. As with their American counterparts, many of these Cameronian neocons are leading figures in a bewildering array of overlapping Think Tanks and front groups and it is here that perhaps the greatest influence on Cameron can be seen. 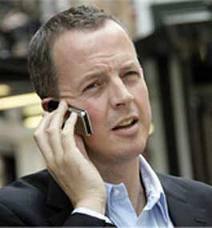 Secretary, and Nicholas Boles who was until 2007 Policy Exchange’s Director and later Cameron’s head of policy. The Daily Telegraph, whose former editor Charles Moore is now PE’s chairman, called Policy Exchange “the largest, but also the most influential think tank on the right” while the New Statesman termed it David Cameron’s “favourite think tank”. In the final years of Tony Blair’s premiership the Notting Hill set would meet at Policy Exchange’s offices to discuss the future of their party and out of that was born the idea that he should make a bid for the leadership. The measure of the think tank’s influence on Cameron and the regard with which he held it was on view in June 2005 when he chose a Policy Exchange event to launch his bid for the top job. When he succeeded, the think tank’s star rose along with him. Money flowed in from the City of London and with its income rising tenfold, Policy Exchange’s research staff grew by a factor of seven. Godson’s familial links to the neocon cause are impressive. His father Joseph, a Polish Jew who emigrated to America in 1926 at age 13, was a neoconservative before there were neoconservatives. A member of the American Communist Party he became disillusioned with Stalin at a very early stage and, skipping the Trotskyite phase, moved rightwards, joined the State department in 1950 and was stationed in London where he allegedly played a significant role meddling in the British Labour party’s internal politics much to the detriment of leftist figures like Nye Bevan, the father of British socialised medicine. His other son Roy, based in Washington, is an expert in the shady business of counter intelligence/black propaganda and served on Reagan’s National Security Council where he helped Ollie North funnel Iranian cash to the Contras in Nicaragua. Dean Godson’s two passions in life are Israel and Ireland, or to be more specific the cause of Likud and Ulster Unionism whose twin fates he saw threatened by the temptations of dialogue with untrustworthy terrorist adversaries, the PLO and the IRA, in the search for peace and political accommodation. Godson joined Policy Exchange when his benefactor Conrad Black lost control of the Daily Telegraph. The new editor, Martin Newland let Godson and Black’s wife and fellow writer, Barbara Amiel go because of their strident politics, as he later explained: “I soon came to recognise that (the Daily Telegraph was) speaking a language on geopolitical events and even domestic events that was dictated too much from across the Atlantic. It’s OK to be pro-Israel, but not to be unbelievably pro-Likud, it’s OK to be pro-American but not look as if you’re taking instructions from Washington. Dean Godson and Barbara Amiel were key departures.” Conrad Black once called Palestinians “vile and primitive” while Barbara Amiel, in one of her pieces, compared Arabs to “animals”. At Policy Exchange, Godson’s singular contribution has been, according to his many critics, to fan the flames of British Islamaphobia under the guise of confronting Muslim extremism and his methods have sometimes brought the think tank into unwelcome controversy. In 2007 PE published ‘The Hijacking of British Islam’ which purported to show that extremist Muslim literature which, inter alia, advocated the stoning of adulterers and the beheading of apostates, was on sale in twenty-five per cent of British mosques. A BBC investigation revealed however that a number of receipts allegedly issued by mosques for the literature had been forged on PC’s or were written by the same hand. None of this seems to have deterred David Cameron however. In February this year he chose his first speech on terrorism as prime minister to announce the failure of British multiculturalism, echoing Germany’s Angela Merkel, and the need for a tougher stance on Muslim groups allegedly promoting extremism. Government contacts with and financial support for such groups would be re-examined and, if necessary, withheld, he declared. The speech was a feather in the cap for Dean Godson and Policy Exchange; it was also a notable triumph for the Tory party’s neoconservatives and clear evidence that Cameron was open to persuasion on other issues. Key figures in Policy Exchange also populate the ranks of the Cambridge-based, British branch of the Henry Jackson Society (HJS), set up in the midst of the Iraq war and so-named after the fiercely pro-Israel, anti-Communist Senator from Washington State, the late Henry ‘Scoop’ Jackson, a figure regarded as something between patron saint and founding father of the American neoconservative movement. Signatories to the HJS’s statement of neocon principles include Cameron allies and Policy Exchange founders, Michael Gove and Nicholas Boles as well as George Osborne’s “fag”, Greg Hands. 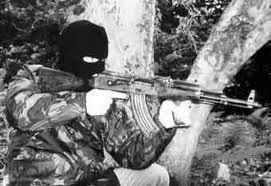 Some of its researchers, like Martyn Frampton, have inherited Godson’s obsession with the dangers of talking to terrorists and Frampton has also been to the fore in projecting the tiny, heavily infiltrated and mostly corrupt IRA dissident groups as a new and major threat to peace in Ireland. The corollary of such alarmism of course is the need for extra anti-terrorist resources, unceasing vigilance (not to mention paranoia) and, ultimately, the military strength to tackle not just the terrorists but those abroad who may sponsor and fund them, whether they be of the Irish or Muslim variety. While many British neocons have warmly welcomed David Cameron’s support for intervention in Libya they also express dismay at his unaltered plans to run down Britain’s military strength. Neoconservatism and the military state, like love and regret, go hand in hand. The Henry Jackson Society has been anything but shy advocating the invasion of Libya and the overthrow of Gaddafi. Type “Libya” into its website search bar and more than sixty articles and references appear, virtually all of them antagonistic to the Libyan leader or urging extreme action against him. One article written by HJS’s Global Security and Terrorism director George Grant and published recently in Rupert Murdoch’s Wall Street Journal was headlined “Put the Mad Dog Down”. As the situation in Libya deteriorated it set up an emergency “Committee for a Democratic Libya”, headed by the subject of Dean Godson’s autobiographical magnum opus, David, now Lord Trimble, the former NI Unionist leader who expressed himself in favour of supplying the rebels with military equipment and the services of unspecified “experts”. Libya, he told its inaugural meeting, “is the sort of situation where it would be utterly wrong for us to hang back”. Its real function, fueling Islamaphobia, soon becomes apparent when you examine the biographies of just two of its research staff. One is an alleged Jihadist apostate called Shiraz Maher who doubles as a Senior Fellow at Policy Exchange. He claims that he was once a member of the extremist Hizb ut-Tahrir group but became disillusioned and quit. He now preaches a virulent anti-Islam gospel given credibility by his purported past history (the neocons’ Irish equivalent is Sean O’Callaghan, a former IRA leader and admitted spy for the Irish police and the British intelligence service, MI5). This then is the British neoconservative network that surrounds David Cameron. 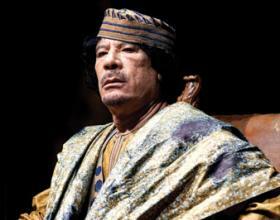 Iraq-style regime change is undeniably their goal with Muammar Gaddafi playing the role of Saddam Hussein. The Iraq invasion was based on the lie of weapons of mass-destruction (WMD) but it is the specter of a failed state that is being used by neocons to justify the action against Libya. As one of them wrote, the war between Gaddafi and his rebels could “create an Afghanistan on our doorstep….a source of terrorism and piracy”. Perhaps, but there’s a large element of the self-fulfilling prophecy at the core of neoconservative thinking. It is worth remembering that Afghanistan became a failed state in the first place because of foreign intervention, first by the Russians and then the Americans. 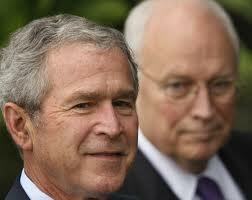 Had Afghanistan been left alone there would have been no Al Qaeda training camps, no 9/11. 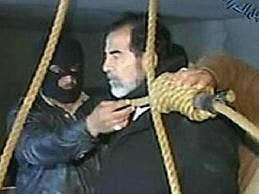 The Bush-Blair invasion of Iraq has likewise left the region more unstable than it was before, more susceptible to Iranian influence than could ever have been imagined in Sadam Hussein’s day. *In the interests of full disclosure I should say that I know Dean Godson quite well and while our respective views of the world, and the Irish peace process, are poles apart, I like him and enjoy his company. I once spoke at a Policy Exchange debate on the NI peace process and found myself, gratifyingly I should add, in the minority. But he was, as always, a gracious and generous host.